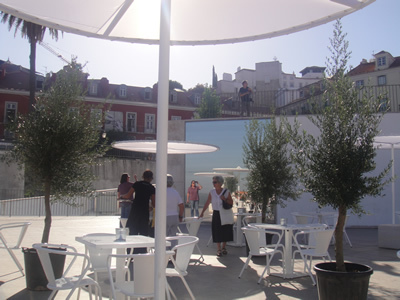 Terrace ‘Portas do Sol’ (Gates to the Sun) is located in Lisbon’s historical center, close to the famous viewpoint (miradouro) with the same name, at Largo das Portas do Sol. 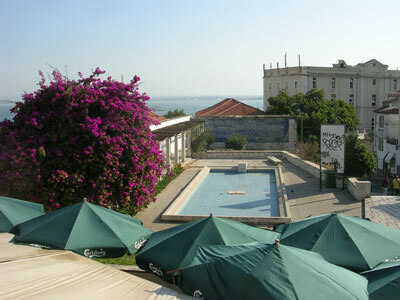 A coffee , cocktail bar and restaurant, and an exceptional location. 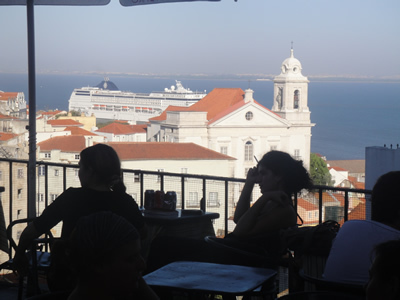 Amazing views overlooking the Alfama rooftops and the river Tagus! 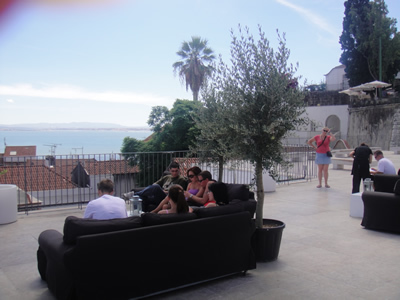 After visiting the nearby São Jorge Castle (the Castle of St. Jorge), this is a place where you can sit down, chill out and enjoy the beauty of Lisbon. This cafe/bar and restaurant is very easy to reach. 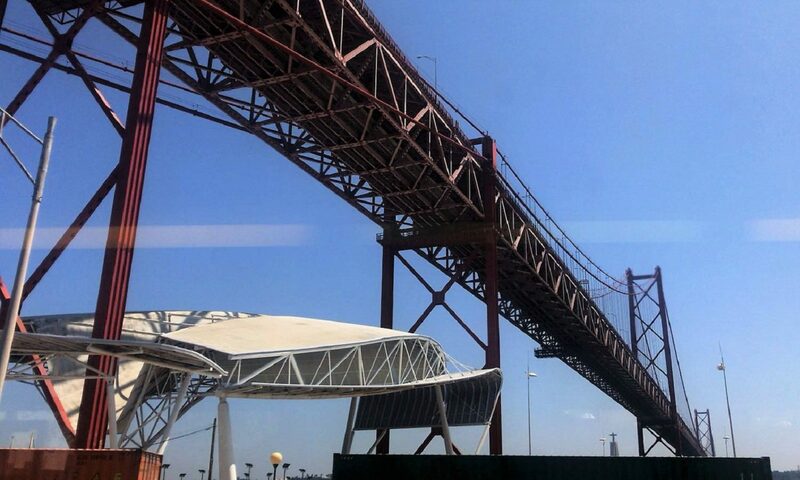 It has direct access on the tram 28 which is the more touristic of the Lisbon trams. 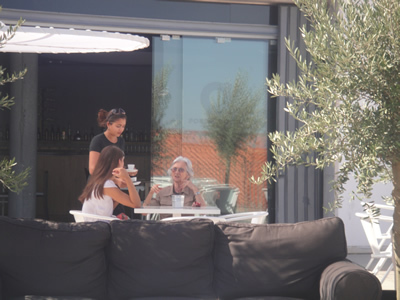 Portas do Sol is a lovely spot to sit down and relax with sofas and soft lounge-music, a place during the day where you can hang out and have coffee and snacks. They serve wines, cocktails, champagne and menu’s. Live music with a DJ on Fridays and Saturdays. Beautiful bar with crystal chandlers and chairs in art deco and romantic style (250m2). Open daily from 10am to 12pm. Fridays, Saturdays and nights before a public holiday until 2am. Seen from the nearby famous viewpoint with the same name, a very popular place for locals and a famous tourist attraction. 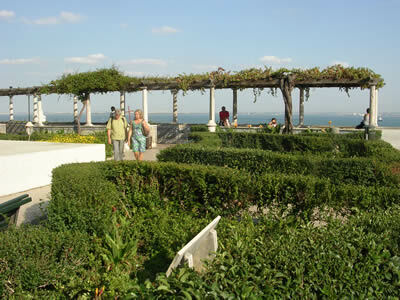 One of the most beautiful places in Lisbon! 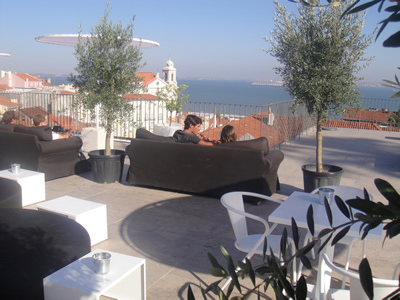 The Belvedere Portas do Sol is a balcony space that all people of Lisbon are proud to have at their disposal. 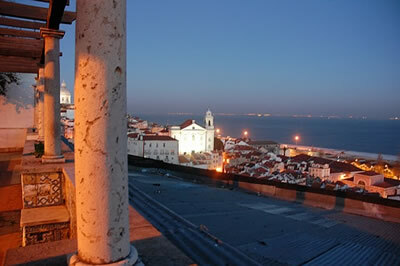 Magnificent view of Lisbon and the typical Alfama district that spans several narrow, winding streets to the river Tagus. 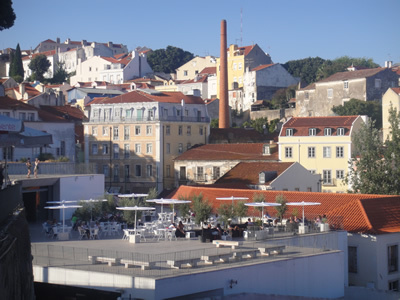 Located in between several highlights of Lisbon (like the viewpoint of Santa Luzia) , the Portas do Sol miradouro is the terrace that every person living in Lisabon would like to have at home….. 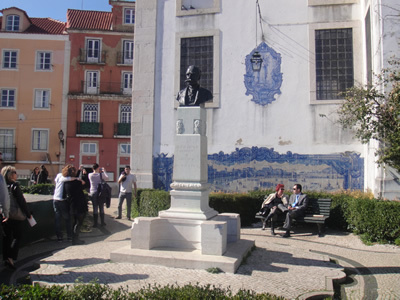 There is also a statue of Saint Vincent holding a boat with two ravens, the symbols of Lisbon. 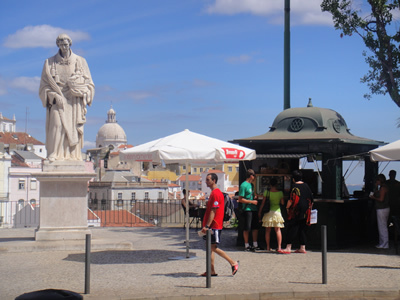 Saint Vincent of Saragossa, better known locally as Saint Vincent of Fora, is the patron saint of Lisbon. In this wonderful 17th C. former city palace, currently houses the Museum of Decorative Arts. Anyone interested in decorative arts in general and the Portuguese Empire in particular will find this collection fascinating. Beautiful azulejos (tiles)! 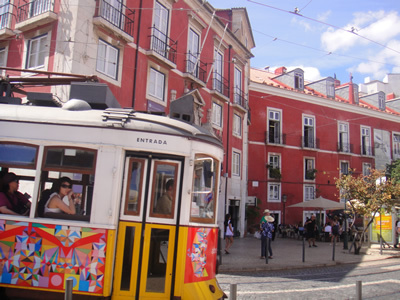 If you like to have a good impression of the historical city of Lisbon, a very good idea is taking this typical little trolley, ‘eléctrico 28′. This legendary tram 28 is a tourist attraction in itself. It goes all around town. Of course you can hop on and hop off. Various small gardens along the edge of the walkway are filled with beautiful local flowers during the spring and summer months. 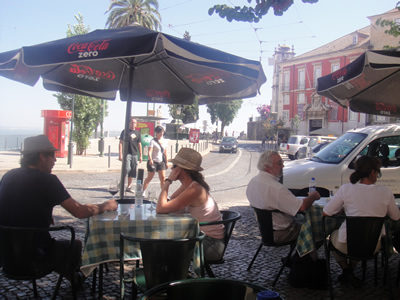 This is a very popular look-out point from the Alfama area of Lisbon, next to the Santa Luzia Church. On the wall of the church are two beautiful tile panels (azulejos): one of Lisbon’s majestic Square Praça do Comércio before the earthquake in 1775, and another one showing the Christians attacking (the nearby) Castelo de São Jorge (Saint George’s Castle) in 1147. 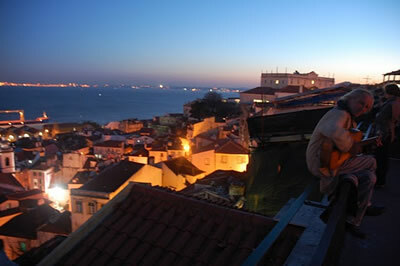 Azulejos (tiles) have become a typical aspect of Portuguese culture. This place is a wonderful tile treasure! 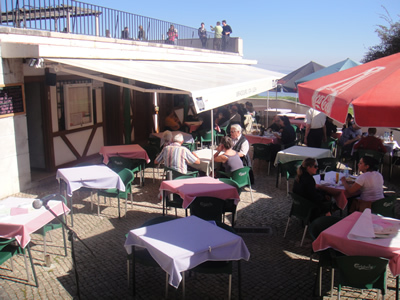 Restaurant ‘Miradouro Sta Luzia’ near the viewpoint, a very popular tourist place.